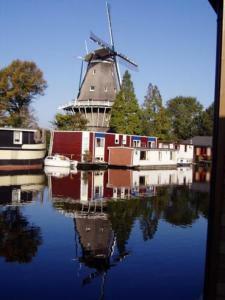 Houseboat Under The Mill, Amsterdam discount hotels and accommodation. A stay in a real Amsterdam houseboat! With a view over the water in a friendly houseboatscene on one of the canals of the city. The location is right next to one of the two big windmills in Amsterdam. Plenty of daylight and sun. The whole houseboat to yourself. In a quiet, peacefull surrounding, just outside of the centry of the city, a 20-minute walk to the edge of the city centre. On your way you will pass the Westerpark with the Westergasfabriek which has turned into a new cultural area of the city, and through "de Jordaan", one of the nicest parts of the city, a cosy, lively old part where you find nice old houses, small fun-shops, nice restaurants and café's with terraces. Nearby there are different types of public transport. There is always parkingspace - cheap parkingfare. Quick access to the airport and trainstation by highway, tram, bus and train. View photos, room descriptions and make online reservations at Houseboat Under The Mill. Save on room prices at Houseboat Under The Mill, Amsterdam.